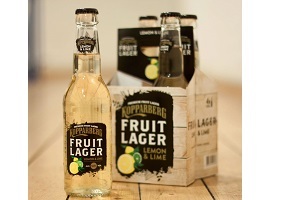 Cider manufacturer Kopparberg is to expand its fruit flavoured offering in the alcoholic drinks space with the launch of a fruit lager. Kopparberg Fruit Lager will have 5% abv and aims to be an alternative to existing radler beers. According to Kopparberg, the product undergoes a “traditional lagering process” but without the use of hops, with fresh lemon and lime juice added instead. Kopparberg senior marketing manager Jodie Alliss commented: “Our research demonstrated that fruit is still a hit with our millennial drinkers, as our fruit ciders remain number one in the category. By launching Fruit Lager, we are extending the drinking occasion for those consumers, via an innovative product that combines subtle premium lager bitterness with Kopparberg’s expertise in fruit refreshment that fans know and love”. Kopparberg Fruit Lager will be available in 330ml bottles across the UK from late February.